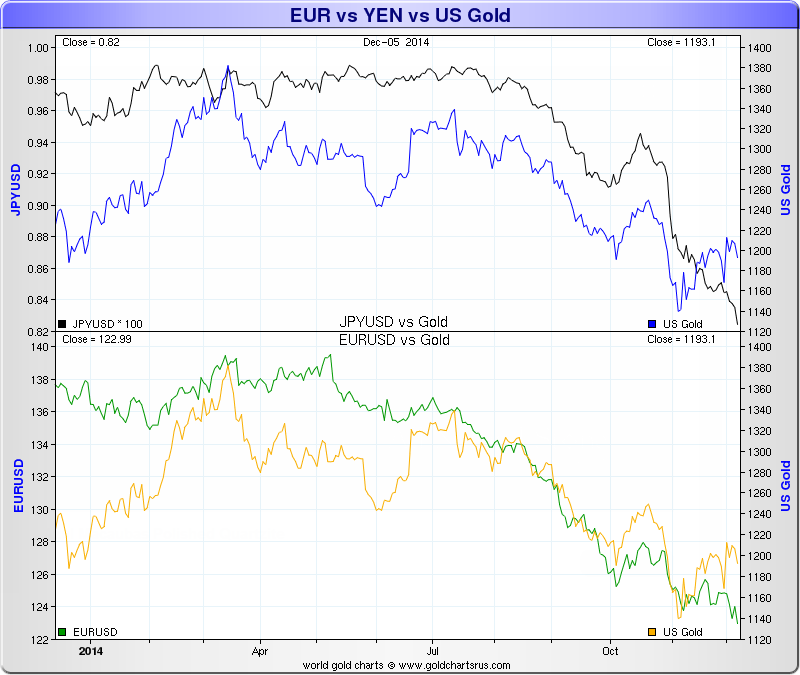 Mish's Global Economic Trend Analysis: Is Gold Tracking Movements in the Yen, Euro, Anything? Is Gold Tracking Movements in the Yen, Euro, Anything? 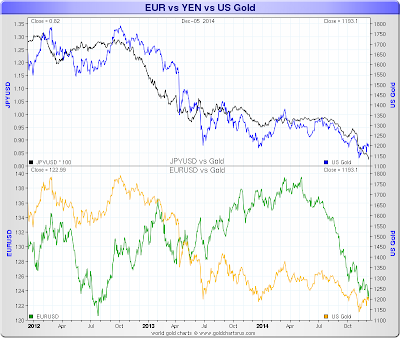 Recently, several people emailed me stating an observation that gold is directly correlated to movements in the Yen. Let's investigate that idea with a couple of charts courtesy of Nick at SharelynxGold (Gold Charts "R" Us). Nick has 1,000's of pages and over 10,000 charts on a subscription basis, but you can check out the site for free until December 14. He made the following charts for me on request. Sure enough. Since 2012, Gold has been tracking the Yen with pretty amazing accuracy. But let's hone in on 2014. 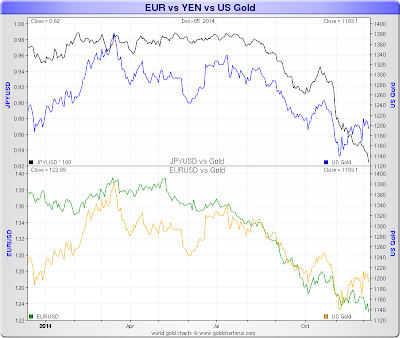 Since the beginning of the year, gold has tracked movements in the euro even better than the Yen. But look still closer. 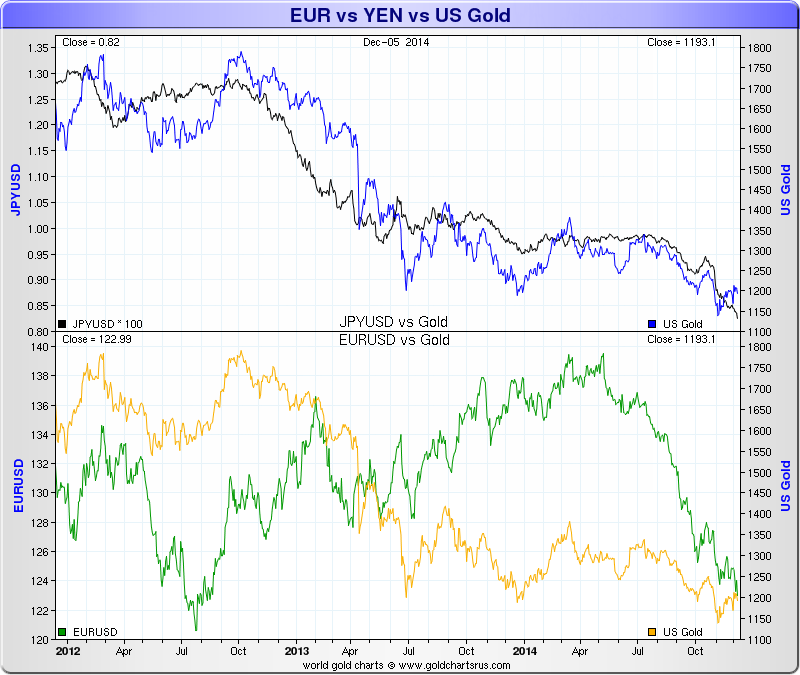 Since November, gold has been inversely correlated to both the Yen and the Euro. This past year shows why these kinds of correlations are typically meaningless. Sometimes gold tracks the euro, sometimes the yen, sometimes the dollar, and sometimes inversely to all of those. I see no fundamental reason for gold in dollars to track the Yen. For whatever reason (or more likely, for no reason at all), the divergence since November (a shift to an inverse correlation from a positive one), might be the end of the previous trend. Often, by the time people spot such trends, that trend is about to end.